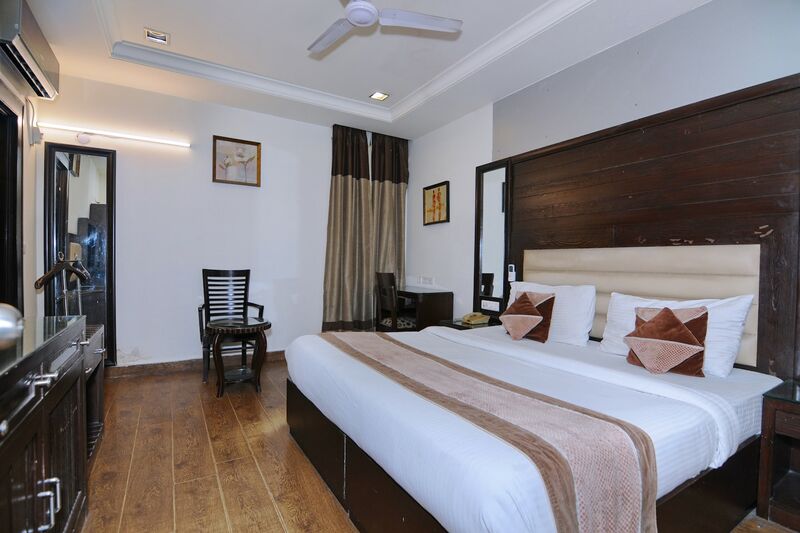 The Grand Hotel is an aesthetic property with spacious and comfortable rooms, located in Kailash Colony, Delhi. The property is near Nehru Enclave, Nehru Place and Lotus Temple. It is also close to Sant Nagar Bus Stop, Kailash Colony Bus Stop and Kailash Colony Metro Station. The hotel has large and classy rooms with dark wooden furniture and paintings. The beds often feature mirrors for a stylish look. There is a common living space in the hotel. All the rooms feature an air conditioner, a television, a room heater, and a mini fridge. The bathrooms feature geysers and hair dryers. Guests also get power backup, CCTV security backup, laundry service, and parking facility. There is also an elevator on the premises. The hotel accepts card payments. Food joints like Juggernaut, Sanjha Chulha, Maxims Pastry Shop, Big Chill, Tbasco Cafe N Bar and Speedy Chow are in close proximity to the hotel.